The Bat! gives a fresh air to the emails and is highly customizable allowing to create email templates according to users desire. The Bat! 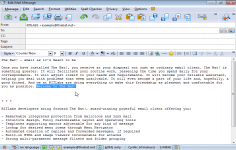 is an great e-mail client with all the functions needed by an informed user. It allows to work without local mail server. The Bat! does all that an e-mail client is expected to do. The Bat! allows, like most modern clients, colorize emails to differentiate or prioritize, archive a series of emails in a folder or automatically classify emails that come from one of the contacts. It includes, in addition, its own spell checker. 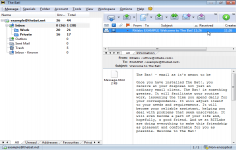 The software offers the possibility to create templates and configure the Inbox Analyzer to automatically respond to certain emails based on determined criteria. Incidentally, The Bat! 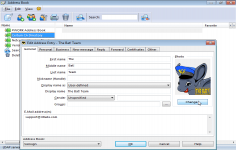 allows import and export formats of the main mail software competitor.